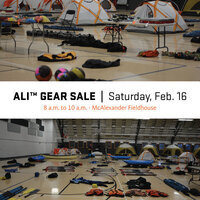 Join us for the Adventure Leadership Institute Gear Sale on Saturday, February 16! The sale will take place at McAlexander Fieldhouse and will go from 8 a.m. to 10 a.m. Doors open at 8 a.m. and items sell fast. Feel free to watch the VertFest climbing competition as it is happening in the same space.